The imagination of our childhood meets classical sculpture. And everything is always current. The human events described in the past and contaminated today, are born again. Here’s how I wanted to represent the heroes who populated the fantasies of an entire generation that, now grown up, is at the forefront of contemporary living dreams that you are they transformed into in suffering? Or what? Dreams, memories, game art, all this you will find here. L’immaginario della nostra infanzia incontra la scultura classica. Ecco come ho voluto rappresentare gli eroi che hanno popolato le fantasie di un’intera generazione . To receive information write an email to info@easypop.art. The beauty of Lamù and the unmistakable part of EasyPop finds its place for the pleasure of those whhttps://easypop.art/images/template/testimonial-friend.jpghttps://easypop.art/images/template/testimonial-friend.jpgo she contemplates and visually sees every small detail and all her set I’m excited!! Easypop like, like, like.. Your works, even if they are stuck on the wall, call you, catch your attention, they make people think and I have to answer their questions. When I receive friends or relatives at home your works always are a subject of discussion because they offer sparks for discussion, or they make you remember something, your anecdotes of life. In short, Roby, they surely get noticed!. 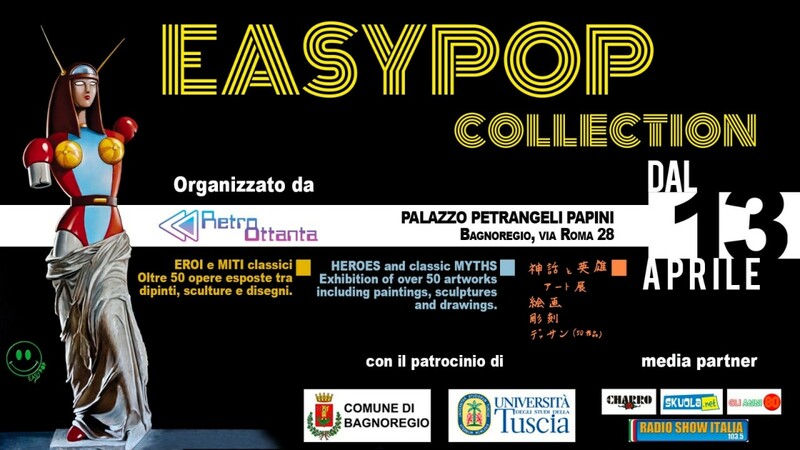 “Easypop is anything but easy, it does not adopt a single language, but it chooses it freely depending on the theme to be tackled, selecting it from the immense repertoire of art. So it is always changing and does not have the objectivity that characterized the original Pop of the 60s because each work implies a reflection communicated through a combination game of images thus leaving room for subjectivity of interpretation. Perhaps the main feature of Easy Pop is precisely that, i.e., the refusal to be trapped in an identity search that relies on a continuity of language and themes”. I see your paintings and I think back when l was a child sitting in front of the TV, thank you!